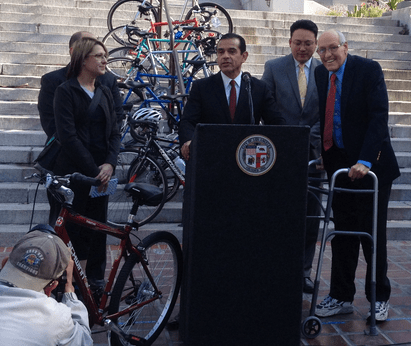 Two years ago, Mayor Antonio Villaraigosa and a host of city officials stood at the podium announcing a new day for cyclists in Los Angeles. Today, he was back in the same place, at the same time, to announce that the city is making progress. 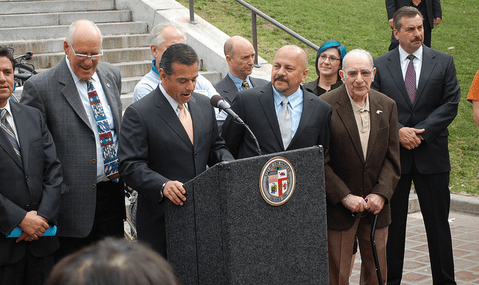 City Council Members look on as Villaraigosa announces the signing of the Bike Plan on March 2, 2010. To date, LADOT has installed 123 miles of new bikeways, at a rate of 61 miles every 12 months. This is nearly 8 times the rate of the previous 40 years. In fiscal year 2011-2012 L.A. installed 76 miles of bike facilities. Two thirds of the way through fiscal year 2012-2013 they’ve already added another 39 miles. This pace of installation includes 97 miles of bike lanes, 4 miles of bike paths, 21 miles of sharrows, and 1 mile of bicycle-friendly streets. There are now a total of 431 miles of bikeways citywide, up from just over 300 when the Mayor last held a bocycle themed press event at City Hall. “Lack of infrastructure is the biggest barrier to more people choosing to ride. When the City installs bike lanes, ridership goes up 100 to 200 percent within the next year,” said Jen Klausner, Executive Director of the Los Angeles County Bicycle Coalition. Of course, celebrating reaching a milestone is different than achieving the end goal. Joe Linton wrote extensively about how the City has achieved its low-hanging fruit projects, i.e. the ones that are easiest to complete. Based on the public opposition to north-south bike lanes pushed by community groups at this week’s westside hearing, the next 123 miles might be harder to build than the first 123. For more on the city’s recent accomplishments on bikeways, read this bikeways fact sheet by LADOT or this fancier bikeways anniversary fact sheet.